Dublin’s city wall on Cooke Street. Today in Dublin, traffic crawls very slowly but somehow very frenetically along into the city centre. Bumper to bumper. Every traffic light piling up in front of it frustrated drivers. Irish drivers are far too restrained to lean on their horns as they do in other cities, but you can smell their frustration. Bikes wobble past them through too-narrow gaps between cars and pavements. People rush in a frenzied hurry, getting in each other’s way. They emerge from shops with bags so stuffed with Christmas presents that they can barely hold them. Do they really have this many friends to buy gifts for? A cold wind whips into them. Squalls of rain spray into their faces. It’s 2014 and Dublin prepares for Christmas. The recession, which came suddenly in 2008 along with the worldwide banking crash, is apparently over. Which means that we must again worship feverishly at the god of consumption. It is apparently our patriotic duty. Some of us miss the crash years a little bit already. Yes we had no money but at least we got a few years break from turbo capitalism and its insistent pursuit of …nothing. Perhaps, like me you might like a stroll around some of Dublin’s quieter spots to ease your mind. Parts of the city’s history come to mind. Perhaps this is merely escapism, but it also fulfills basic human requirement; to put reality into a context – to make it make sense. If you walk through the back gates of Dublin Castle, onto Great Ship Street. You will find yourself very briefly in what is left of medieval Dublin. The last intact section of the city wall (built in the fourteenth century) runs from here to Cooke Street. You can walk through it at St Audeon’s gate gate. 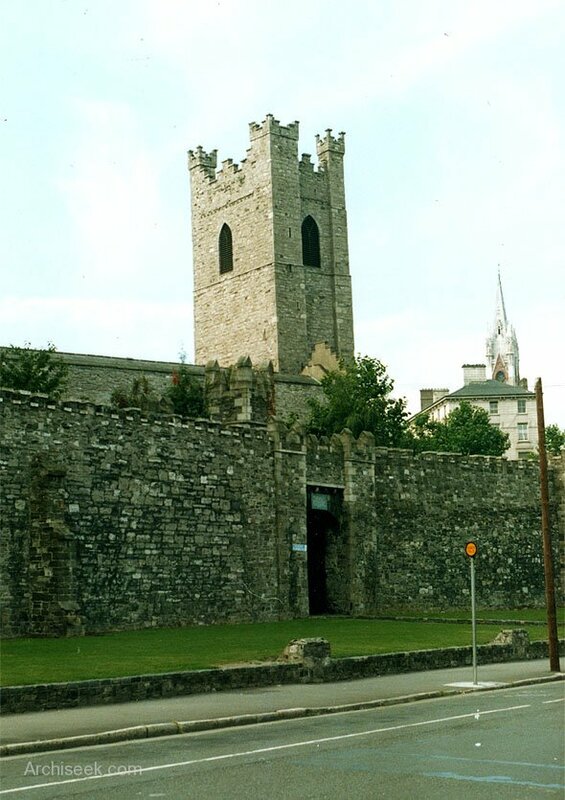 In medieval times the walled city was a small enclave that clung to the south side of the river Liffey. The river itself was mainly used a dumping ground by medieval Dubliners. (Their anti-social modern equivalents who don’t want to pay for bin collection drive to the mountains to find particularly scenic spots and dump their rubbish there). This stretch of wall survived the city’s rapid growth in the 17th and 18th centuries – which saw the rest of its defences demolished – because people had built their houses right up against it so that the city wall here could not be knocked down without also destroying the surrounding houses. It was only with slum clearance in the 20th century that the city wall re-emerged into view. Walk across the river and you’re attention will inevitably attracted by the Four Courts, it’s green dome rising over the Liffey. 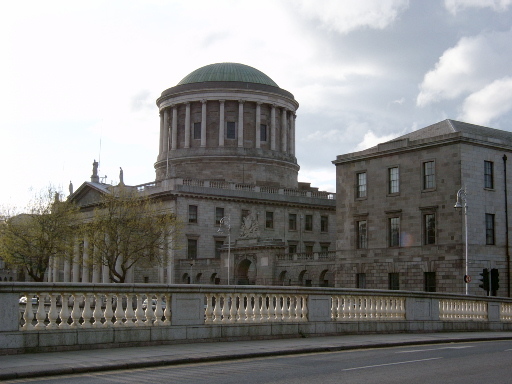 Up until 2011 it was the centre of Ireland’s criminal and supreme courts but since the construction of a new court complex down the river, near the Phoenix Park it has housed only civil cases. Back in the 18th century, Dublin’s belle epoque, the famous architect James Gandon constructed it and other buildings such as the Custom House to resemble Greek or Roman public buildings – civilisation, progress, reason. 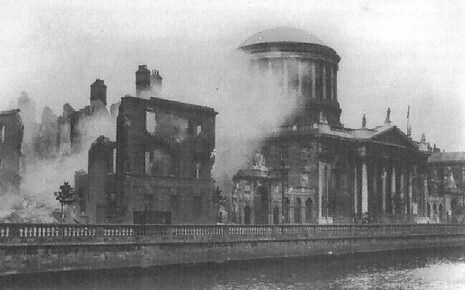 But when I see the Four Courts I also think of the battle that took place there in 1922 at the start of the Irish Civil War. The Four Courts in 1922. Ernie O’Malley, who was there, recorded in his memoir of how snipers sheltering in the Dome picked off Free State soldiers in the surrounding street he remembered the exultation of one sharpshooter when he ‘got’ his target. It has always sent a shiver down my spine. I also picture the anti-Treatyites’ armoured car whizzing up and down the quays and the Free State field gun across the river on Parliament street pounding the courts. That and the massive mushroom cloud that rose over the complex when the anti-Treatyites’ arsenal in the Public record Office went up. Walking down Henry Street would be a bad idea at this time of year – the festive shopping mayhem being particularly frenzied there. If one did, one would see stalls set up at either side of the street where the hawkers shout in Dublin accents so strong they may qualify as a separate dialect of English; ‘Wrapping paypah teeyoo fur fuiave’ [Wrapping paper, two for five]. 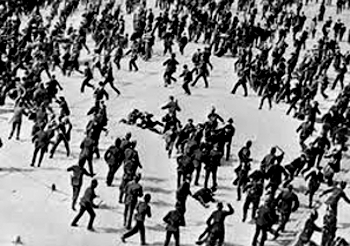 But I would prefer to walk down the riverside part Bachelor’s Walk where back in 1914, British troops fired on a jeering crowd after the Howth gun running. That was in the days before mass motorised transport of course. If anyone tried marching down Bachelor’s Walk today the casualties at the hands of the juddering heavy goods vehicles that lumber through it on their way to Dublin Port would probably be considerably greater than the three who died there in 1914. 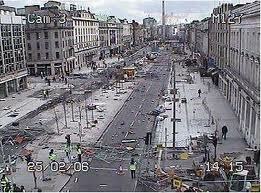 O’Connell Street after the 2006 riot. On O’Connell Street you might as well stop for a second in some quiet spot and muse over the street’s history. (Not for too long though or someone might assume you’re there to buy drugs and/or try to beg from you). But ever since I was a teenager I stopped here and wondered at it. There was the GPO the headquarters of the 1916 Rising. And there was Clery’s from where in 1913 Jim Larkin appeared and caused a riot. At one end of the street Daniel O’Connell, the ‘Liberator’. At the other end Parnell; ‘no man has the right to fix the boundaries of the forward march of a nation’. In 1913 and 1916 the street was crisscrossed with trams (indeed they were the main focus of the Lockout in 1913 and used as barricade in 1916). And today again, after an absence of about 50 years the street is again crossed by tram service, the Luas. I always picture what would happen if the Luas drivers walked off the job like Larkin’s members did in 1913. I remember in 2006 watching an anarchic riot breaking out as loyalist ‘Love Ulster’ marchers assembled at Parnell Square to attempt to march down here. The GPO is in a way, a kind of secular shrine in independent Ireland. The tricolour flies proudly over it. In the window a statue of Cuchullian represents the fallen heroes of 1916. And yet it is and always has been a working post office. It is a little incongruent. I am not in favour of living in the past or of worshipping it. 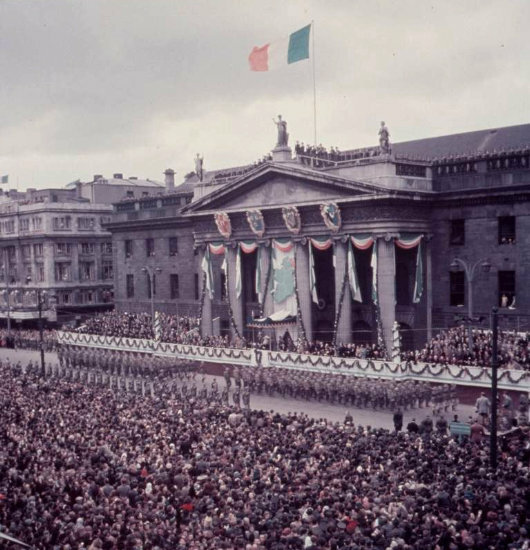 Probably the majority of people on O’Connell Street today are not Irish and know or care nothing about Irish history. And personally I’m fine with that. A city is an organic body, its natural state is constant change. But ever since I was a teenager and was old enough read veteran revolutionaries like O’Malley (who by the way came upon the 1916 Rising purely by accident) I have stopped here for minute and pondered the death and heroism and veneration for modern Ireland’s founding myth and wondered if it all worth it. Written by: John_Dorney on 19 December, 2014.on 19 October, 2015. 4 Responses to "Winter in Dublin"
Thanks Terry (and DJ and Michael), I love to hear about other people’s reminisces as they walk through the city. We all have our own mental histories and geography of our home place. I most thoroughly enjoy these wonderful stories, of past for many like myself can associate with ease and understanding, I just love history so rewarding. Nice piece, John. Indeed, it is good to keep history alive in the consciousness of the people – if only to ensure that we do not repeat the bad bits.